"Just close your eyes and dream away to the 60 - and 70's rock, listening to an energetic band with an incredible groove. You will be filled with the feeling that clearly we can move mountains if we help each other." 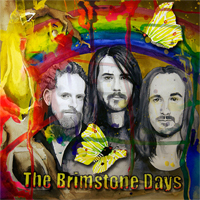 The Brimstone Days, shortened TBD, is a band from Malmö in southern Sweden. The band always had their mind set on becoming a knock-out live act - and with hundreds of gigs all over Europe (Sweden, Denmark, Poland, Germany, Netherlands, Scotland and Spain) they have put their stamp on this statement a long time ago. With their full-length album "On A Monday Too Early To Tell", TBD has once again shown that they rule the dance floor. The amazing grooves that this album features makes it just impossible to stand still! In the veins of Hendrix, Zeppelin, Free, Humble Pie and Leaf Hound, this power trio continues to electrocute the live scene around the world. "On A Monday Too Early To Tell" is a statement - proving that music doesn't become more alive than this. The album will be released on Transubstans Records September 12, 2012.